From professor and poet to author and architect, Alfred Caldwell’s long career led him on a varied journey with many paths. While Caldwell is most commonly known for his landscape designs, he also spent time working as the Superintendent of Parks in Dubuque, Iowa, as well as a professor at Chicago's Illinois Institute of Technology. Recently, these two locations from Caldwell's past met again when the Dubuque Museum of Art brought more than 80 architectural blueprints to The Center for treatment. "Eagle Point Park: Topographic Drawing - Preliminary Park Plan"
The works were donated anonymously to the Museum in 2009. In an effort to bring the pieces back to Dubuque where they originated, the collection was donated to the Museum in Caldwell's honor. "It's quite the collection. It's a great history of that era and its projects. Caldwell was such an outspoken and passionate artist. We are so fortunate to have these pieces," shared Stacy Peterson, Associate Curator and Registrar at the Dubuque Museum of Art. "Eagle Point Park: Project Location Plan - Plat A"
Caldwell worked for the Chicago Park District until 1940, creating comprehensive landscape plans for several major parks, including Jackson Park and the Lily Pool in Lincoln Park. A horizontal design emphasis constructed through locally-sourced materials and an abundance of plant life are trademarks throughout his projects. "Ledge Garden: Rose Garden Pool"
In Caldwell’s well-known designs for Eagle Point Park in Dubuque, Iowa, influences of Frank Lloyd Wright’s organic designs are present. When “Eagle Point Park: Topographic Drawing” came to The Center for treatment, it exhibited selective pressure sensitive tapes along the verso of the piece, as well as severe foxing and discoloration from pressure sensitive tapes along the left edge. There were moderate handling dents and creases throughout the piece, as well as a severe vertical crease at the approximate center of the drawing. The piece exhibited select tide lines, distortion, and age-related discoloration throughout. Many of the works from the Museum's collection that came to The Center exhibited similar age-related condition issues as the Eagle Point drawing. Almost all of the pieces had been rolled tightly, and they ranged drastically in media from blueprints to original drawings. They also varied widely is size and form. "When they came to the Museum, they were really in delicate condition. They were too fragile to handle or accession. We just put them into storage," explained Stacy. 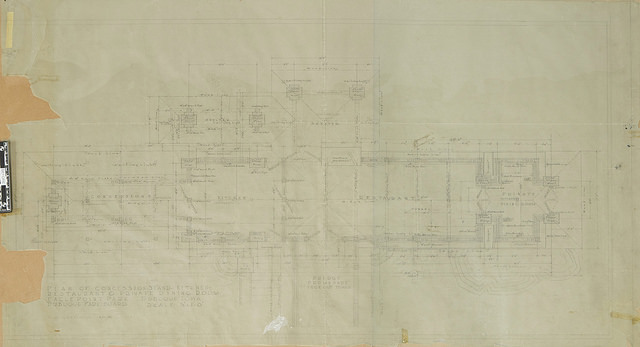 "Building Group I: Plan of Concession Stand, Kitchen, Restaurant, and Private Dining Room"
The Museum elected to move forward with the treatment of a portion of the drawings, with the intention of treating the remaining collection after funding was secured. First, the selected blueprints and drawings were selectively surface cleaned using the appropriate conservation methods and materials. Next, the pressure sensitive tapes were removed and any remaining residue was reduced. The creases and tears were then stabilized and reinforced using thin Japanese tissue with wheat starch paste. If necessary, select pieces were blotter washed at the discretion of the conservator to reduce handling dents and creases. Each drawing was counter rolled to reduce distortion as best as possible; after the counter rolling, the blueprints and drawings were placed in Mylar sheets to aid in stabilization and allow for safer handling and storage. The Center is still in the process of finishing treatment on a portion of the drawings. After they complete treatment on each piece, our Digital Conservator then conducts a high resolution scan of each blueprint or drawing. The scan is then digitally output to a secure link that is sent to the Museum for their archive. As the pieces are completed and returned in phases, the Museum proudly puts the newly-conserved works on display. "As they come back, we integrate a Caldwell exhibition into our calendar. It's great to have these works in stable condition so when they're on exhibition or in storage they are not deteriorating," Stacy told us. "Now that they have been treated, they can be shown or stored as individuals. They are flattened and can be handled and looked at." As the Museum raises funds, Stacy explained that they hope to release more works for conservation. "I'm so glad we have a professional company who can take care of these pieces. These are large, delicate works, and we are grateful to The Center and their work on this collection."